The New TVS Flame SR 125 has got talks among the bike lovers in the hope of experiencing a fresh adrenalin rush. It enters the market with a host of exciting features beside enhanced performance which would absorb the attention of the young bikers. Ergonomics is comfortable even for a tall rider. The bike is equipped with handle bars that are matt finished and alloy grab rails and wheels. 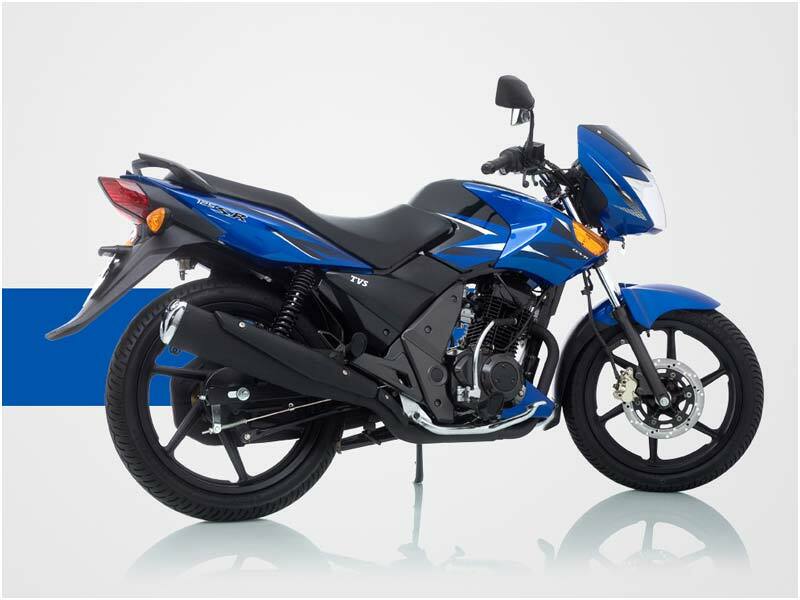 The New TVS Flame SR 125cc is available in two variants with disc brake and drum brake. But TVS has tough competitors in the 125cc segment with all the bikes such as Honda CBF Stunner and the Bajaj Platina 125, which come with amazing neutral handling and style. The New TVS Flame SR 125 is based on CCVTi (Controlled Combustion-Variable Timing Intelligent) technology which is propelled by 3 valves. It is a perfect blend of power and the latest technology to provide phenomenal pick up and optimum mileage. The CCVTi engine which uses twin spark plugs produces maximum power of 10.5 bhp and a peak torque of 10 Nm. The most note-worthy change in the TVS Flame SR125 is the impressive wider rear tyre. It boasts of many features including the stylish headlamp with two position lamps and the embedded turn signal lamps for the head turning sporty look. The 240 mm front disc brake with the well designed triangular exhaust not only enhances the look but also offer smooth performance and sound. The bike sports an elegant the first of its kind digital console which houses intelligent mileage indicator (IMI), low fuel warning and service indicator. The rear end of the bike sports a dual lens tail lamp that is first in its class. TVS Flame SR 125 is the only Indian motorcycle to be equipped with a gadget boot which provides the facility of on-tank storage. 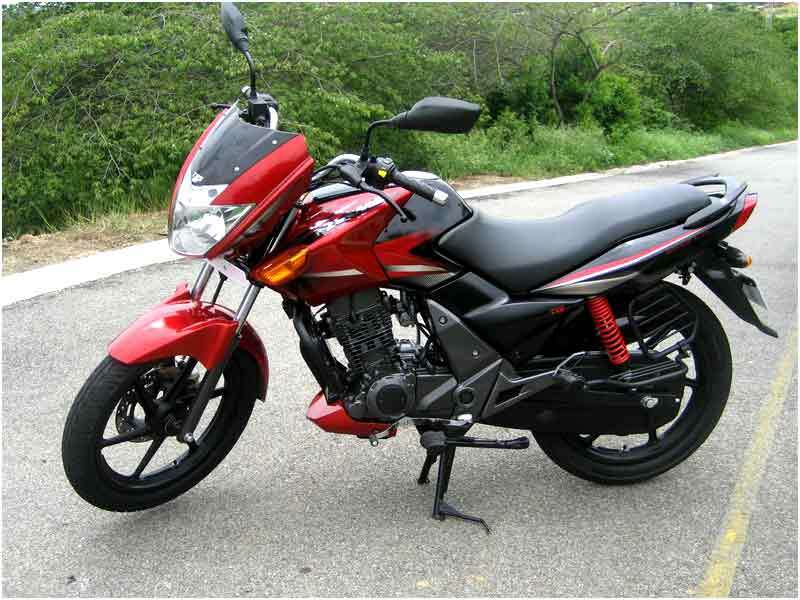 The New Flame SR125 comes with widest rear tyre in its segment that are intended to provide greater on-road stability. Flame comes with an electric start and the top speed is 95 kmph. Shaped on a rectangular frame, flame maneuvers tight corners easily. Straight handle bar and upright seating position ensures free commuting. Large knee recess makes even the tall riders comfortable. Seats are wider and merge with the tank smoothly. The rectangular swing arm with 5-step adjustable twin-tube suspension transfers little vibration to the rider as well as the pillion. Best pick for city drivers, TVS Flame SR 125 gives an excellent mileage of 60-65 kmpl. 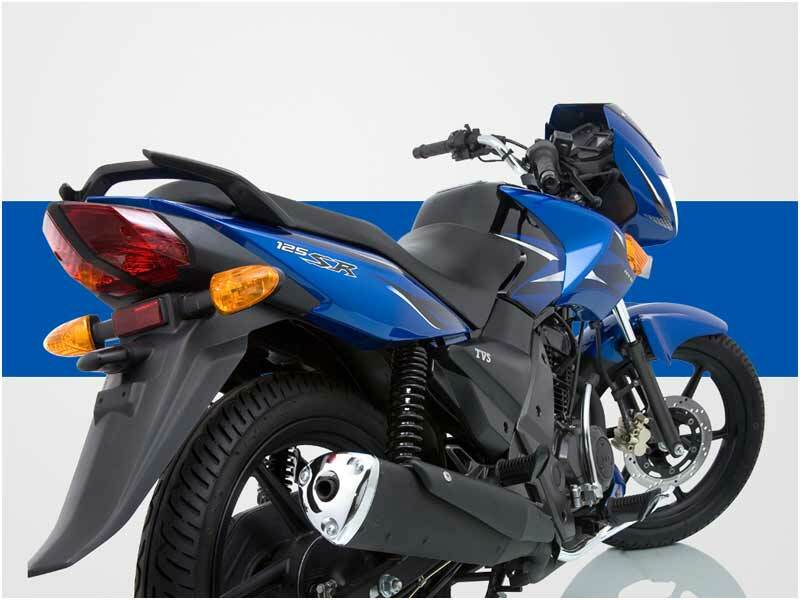 TVS Flame 125cc is available in 3 colours � Elite Blue, Mica Black and Scarlet Red. It is available in two variants; one with disc brakes and other with drum brakes. For the drum-brake version, the cost is Rs.45, 000/- (ex-showroom, Chennai) and for the disc brake variant, it is Rs.48, 000/-. Head Lamp 12V 35/35 W- halogen.